Aside from the media events, music and parties, one of the major highlights of the SXSW festival happening in Austin right now is the tacos. Today at 2 p.m. CST, regional chain Torchy’s Tacos is holding an eating contest with a notable man to beat, local competitive eater Hungry Todd Rungy. The winner must be the fastest to devour two massive Ace of Spades tacoseach one an eight-inch flour tortilla filled with jalapeño sausage, smoked brisket, a fried egg, cheese, green chili queso, cilantro, queso fresco, sour cream and hot sauce. 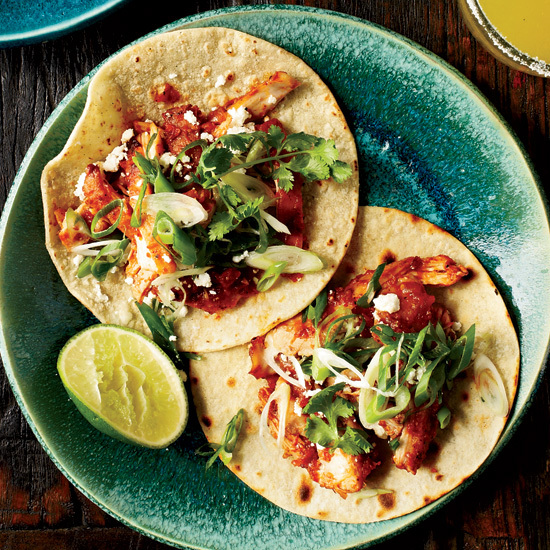 In the spirit of the event, but much more manageable, these Chicken Tinga Tacos are braised in a smoky Mexican tomato sauce that requires only a few ingredients, including canned tomatoes and chipotles in adobo.